Homes with mountain views are always high on our buyers list of "wants" when shopping for a home in Scottsdale. 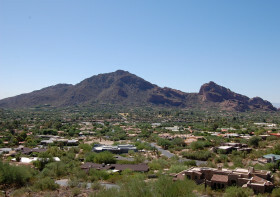 From this page you can easily browse all Scottsdale homes for sale with mountain views. 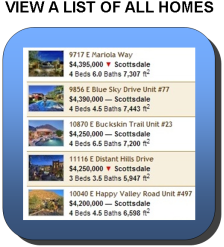 Our listings are updated daily from the Arizona MLS. Rest assured, you are viewing the most current inventory and information available. 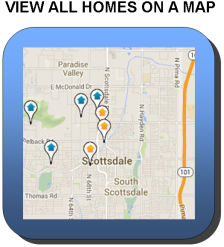 To begin, simply click on one of the buttons below to view homes on a list, or view by property location on a map. If you're looking for homes in the Scottsdale area with mountain views, you're in luck. Approximately 55% of all homes in the Arizona MLS are listed as having mountain views. However, there's views, and then there's VIEWS! To determine which homes and communities offer the best views you're going to have to do some leg work looking through listing photos. If a house has stunning mountain views, believe me, the listing agent is going to market them in the listing photos and detail section. In addition, you really should have a chat with your Realtor about the subject, as we know through experience which communities are most likely to give you the views you desire. Better yet, let us do the work for you. We're here to help. In our opinion, the Troon area offers the best mountain views in Scottsdale period. Some of the residences have unobstructed views of Pinnacle Peak, and they're breath taking. Troon is somewhat North though, so if you're looking for something a little bit more central, consider McDowell Mountain Ranch, Scottsdale Mountain or Silverleaf.